A subscriber asked me to write up some text animation techniques, so here are two that you might like to use. These work best when the text plays center screen and your slide doesn’t contain too much else. You wouldn’t use these techniques a lot, or with too much text. This technique fades in and out three sizes and shades of a word, one after the other. You can see how it looks here. Click the text box’s outline and copy it to the Clipboard. Paste it two times onto the slide. Drag the three text boxes apart from each other. Eventually, you’ll place them on top of each other, but it’s much easier to select them when they’re separated. Notice that I have a plain white slide and one word. Change the properties of the text to create variations. I used 96, 72, and 48 point text, with light gray, dark gray, and black colors. Of course, if you want a different effect, you can do something different. In PowerPoint 2003, choose Slide Show > Custom Animation; in PowerPoint 2007, Animations tab> Custom Animation to display the Custom Animation task pane. In 2010, click the Animations tab. Select the first text box and choose Add Effect> Entrance> Fade. (If you don’t see the Fade animation, click More Effects to find it.) Set the Speed to fast. Leave the Start as On Click (the default). In PowerPoint 2010, click Add Animation to find the entrance fade animation. Select the second text box and choose Add Effect> Entrance> Fade. Again set the Speed to fast, but this time set the Start to After Previous. Next, you want the third text box to fade in so select it and choose Add Effect> Entrance> Fade. Set the Start to After Previous and the Speed to Very Fast. Finally, you want the second text box to fade out, leaving just the third text box. Select it, and choose Add Effect (or Add Animation)> Exit> Fade. Set the Start to After Previous and the Speed to Fast. Note: You can always change the order of your animations by selecting an item in the Custom Animation task pane and dragging it to a new location or using the Re-order buttons at the bottom. To display the task pane in PowerPoint 2010, click the Animation Pane button on the Animations tab. Save your work and test the animation to see what it looks like. Either go into slide show view or click the Play button in the task pane. Save and try out your animation! You can add another animation to your objects to increase the intensity of the animation. 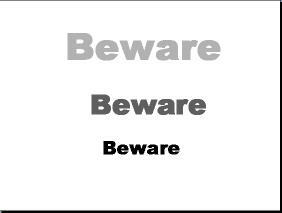 For example, try adding a Magnify entrance effect to all three text boxes. Set the speed the same as the Fade In animation and place the animation in the task pane right after the Fade In. Set the Start to With Previous. You can see how it looks. You can make text appear letter by letter; to add to the effect, you can add a typewriter sound. You can see the animation here. In PowerPoint 2003, add a text box from the Drawing toolbar (in PowerPoint 2007 and 2010, go to Insert tab> Text Box), and type the text. On the Custom Animation task pane, choose Add Effect > Entrance > Appear. 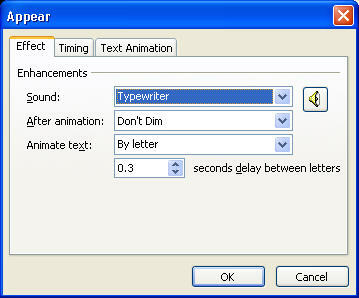 In 2010, choose the animation from the Add Animation drop-down list. In 2010, click the Animation Panebutton. Click the animation item in the task pane. Click the down arrow and choose Effect Options. On the Effect tab, choose By Letter from the Animate Text drop-down list. Set the delay between letters. I chose 0.3 seconds. From the Sound drop-down list, choose Typewriter and click OK. Try the animation. I had the following problem — there was no clicking sound for the last letter. That might not bother you, but it bothered me. I solved the problem by adding another letter at the end of the word and making it the same color as the background (so that it was invisible). This worked! Thank you so much, I tried it in powerpoint 2010 and did great. I offer 1-on-1 coaching at http://www.ellenfinkelstein.com/estore/1-on-1-coaching.html. If you contact me, we could work out a rate for fewer sessions. No problem animating my first text box, but cannot animate more the one on each slide. You should be able to add animation to multiple objects and also more than one animation to any single object. Which version of PowerPoint are you using and what happens when you try to animate another object? 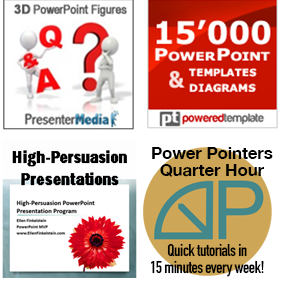 This was an old tip, so I just updated it to include instructions for PowerPoint 2010. Thanks a lot 😀 it helped me to get the typewriter animation. Glad to help. If you haven’t already done so, sign up for my weekly newsletter, so you won’t miss the new tips I write every week! Didn’t understand how to do the typewriter effect. Also when i looked at the slide show the text variations weren’t showing up. When I left and looked at the slides the text variations were there.